This is one of those strange movies that you simply cannot ignore. It’s currently holding an extremely low rating on IMDb, warning viewers to stay away from this science fiction movie. All the reviews are from the year 2005 and amidst all that hate there are a couple of decent ones. So, let’s start from the beginning: This was supposed to be a huge blockbuster, with Renny Harlin directing and Pierce Bronson starring. However, Renny didn’t get along well with Ray Bradbury who wrote the short story that this movie is based on, so he was fired and replaced with Peter Hyams, a man who directed one of the better science fiction movies of the “first wave” in the seventies, Capricorn One. He was also behind The Relic, End of Days and Timecop, all commercial movies that have done well. His masterpiece is Outland, starring Sean Connery and set on Jupiter. Oddly enough, exactly the opposite happened during shooting of Exorcist: The Beginning and Renny Harlin jumped in to replace Paul Schrader. During post-production Franchise Pictures went bankrupt and the budget shrank by whopping $30 million. So, with all these troubles, the end product seems like a huge win for everybody. Pierce Bronson was scrapped and Ed Burns hired as a replacement. He did a decent job along with the rest of the crew. Ben Kinglsy was, of course, phenomenal and one of the few great elements in this mess. It is the year of our Lord Satan 2055 and time travel is something that’s relatively common. Well, relatively common for people who can afford it. Company called Time Safari offers their customers a unique experience: they can travel back in time and kill a dinosaur! 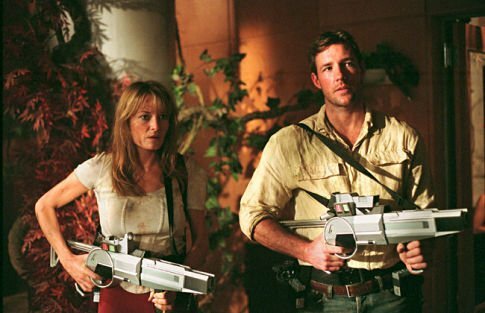 Of course, they can only kill dinos who were going to be killed anyways, so they are not altering the timelines. However, when time travel is involved, you can bet that something will go wrong. People get so fixated on those visuals that I simply do not understand how can they say they are science fiction fans. Sure, there are a few scenes that look off, but in my opinion this just helps with the easygoing atmosphere. Considering how there are only a few good science fiction movies being released each year, we sometimes have to dive into the deep end to find something to watch. 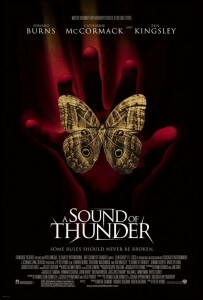 A Sound of Thunder has a really good main story and is set in the future. Now that’s called lowering the bar and if you’re one of those haters, you can watch it as a warm-up movie, enjoy. Fun Stuff: Pierce Brosnan and director Renny Harlin were originally attached to this film.